Set around the time that the age of samurai is in decline (firearms have started to appear, and in a few years Tokyo is about to become the new capital of Japan), Seibei Iguchi is a low ranking samurai. His wife has died, and he is in debt paying for her funeral, and also trying to bring up his two daughters and look after his aging mother. As soon as his work is over, he rushes home to look after his family, and to do evening work so he can pay the bills. The other samurai mockingly call him 'Twilight' because he works in the night. With no wife to look after him, he has slowly become more and more unkempt, and his colleagues look down on him and pity him. Despite this, Seibei has discover true happiness he would never have known if his wife were still alive. Nothing makes him happier than to see his two daughters growing up, and he feels anything but pity for himself. Things get interesting when he bumps into a childhood friend and discovers that his friend's sister, Tomoe (the local hottie ) has had a terrible marriage to a drunk who hit her, and that his friend had to see the clan leaders to have the marriage declared null. Seibei had always secretly loved Tomoe, and the next day she turns up at his house and they have fun reminiscing about their childhood. Later that night, Seibei walks Tome home, only to discover her drunken ex-husband at his friend's house, casing trouble and challenging his friend to a duel. Knowing his friend is not a very accomplished swordsman, he accepts the duel on his behalf. Firstly, I should say that this film is not so much about samurai. At is core is a great film about a man discovering the joys of home life from because of a tragic event. The scenes where Seibei is talking to his children really illustrate this, and are lovely to watch. That said, there are some fight scenes, which are refreshingly brief and realistic in their execution, and not overly flamboyant. ...taking that out of context, you 気持のないつらいもの!! Give the little girl a break. Why? See the movie. 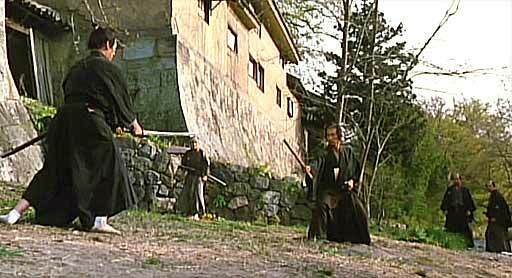 Really, it may seem like another samurai movie but it's nothing like at all. I don't know if this is much of a recommendation, per se, but it's at least as real and touching as "Harold & Maude" without being so twisted. Does anyone know if it's actually based on a real story? I got the impression that it might be based on a real story, because of the way the girl narrator 'grew up' as Japan entered it's modern era. I wonder if it was a book she wrote or something?